`SPOOKY. GRIPPING AND INTRIGUING.' Sophie McKenzie, author of Girl, MissingSeventeen-year-old Elliott hasn't slept properly for six months. Ever since the accident that nearly killed him, a shadowy figure has made its presence felt - a figure only he can see. Elliott is convinced his near-death experience has enabled him to contact the dead. But are his ghostly visions real, or the effects of a damaged mind? When Elliott gets a job at a supposedly haunted museum it seems like the perfect chance to discover what's really going on. But his arrival doesn't just cause a stir amongst the living. Unwittingly, Elliott uncovers the museum's terrible secret ... and a spirit hell-bent on using him for revenge. A brilliant, spine-tingling YA novel by award-winning author M.
Harrison. 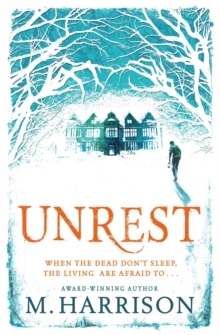 `Chilling' The Bookseller `I devoured Unrest.Or rather, I felt it devoured me. I loved it.' Sarah Singleton `It takes great skill to create an atmosphere that creeps off the page into your veins.